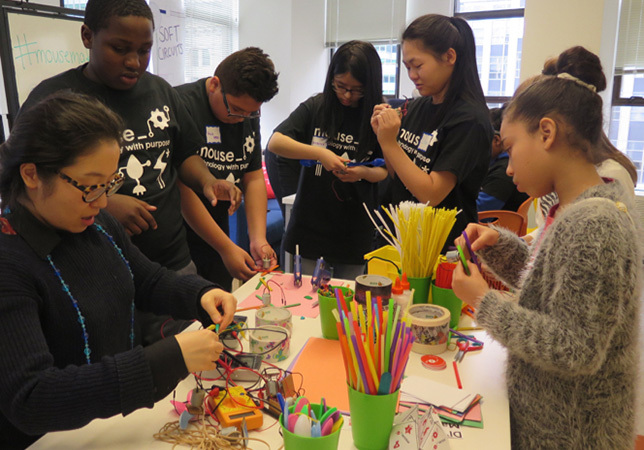 Mouse, a New York-based nonprofit, is launching a handful of new and continuing STEM courses this fall, aimed at teaching students new skills based on cutting edge technology. New courses include sewable technology and digital portfolios. One of the continuing courses is a partnership with Parsons School of Design and Cooper Hewitt, Smithsonian Design Museum to create assistive and adaptive technologies for people with cerebral palsy. For instance, kids will design a joystick-controlled mechanism whereby patients with cerebral palsy can mix paint, and turn an arduous, 10-20 minute task into an easy, 10-second activity. Other innovations could involve a new breaking system for wheelchairs, and a safe laser-pointing system to warn pedestrians that a wheelchair is oncoming. Another continuing course will be a collaboration with the national organization and STEM curricula provider, Games for Change. A primary goal of Mouse is to empower students to use technology to solve real-world problems and make meaningful change in the world, according to the nonprofit’s website. Creating more diversity in STEM is another mission. According to Rabuzzi and other sources, STEM fields still lack diversity, especially when it comes to women and people of color. Over the past 20 years, Mouse has created platforms and courses that have impacted 40,000 youths, Rabuzzi said. The organization’s annual budget is between $2.1 million and $2.2 million, he said. Rabuzzi said his organization is growing its presence in California, with almost 100 schools using its platforms and curricula during and after classtime. Mouse’s goal is to grow even more actively in Southern California. Mouse is also experimenting with virtual reality, and plans to have VR projects for students in the near future, Rabuzzi said. For more information on Mouse, visit the organization’s website.